CIRCA 1919 - French soldiers boards trucks bound for Germany. hd01:10CIRCA 1910s - Soldiers in the American Expeditionary Forces fire antiaircraft artillery at German planes. hd01:14CIRCA 1940s - A blind veteran convincing a farming community that their efforts directly aid the war effort. hd00:55CIRCA 1916 - Federals search for loot after a battle in the Mexican Revolution. 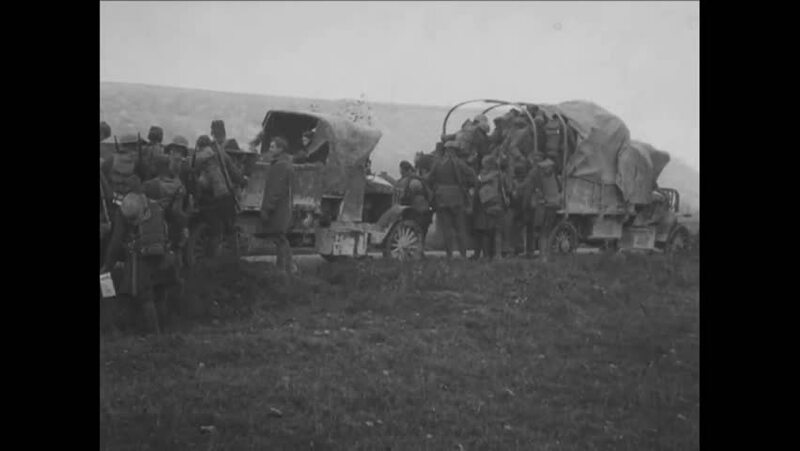 hd01:00CIRCA 1918 - Troops travel by cart and horse on the way to at St. Mihiel. hd01:17CIRCA 1910s - Soldiers and a rubbled church are shown in a recaptured town during the Meuse-Argonne Offensive in France in World War 1.
hd01:36CIRCA 1918 - The ruins of war-torn Nantillois are shown. hd00:58CIRCA 1940s - American troops invade Italy in World War Two.